Great for St Patrick's Day. 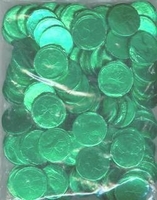 Bubble gum coins wrapped in green foil with shamrocks on them. Share the gold at the end of the rainbow with these treasures. These are perfect for handing out at your St. Patrick's Day party along with your corn beef and cabbage.